The D-Link AirPlusG DI-524UP wireless G router is an advanced but affordable networking solution for home and the small office. This router combines the high-speed 802.11g wireless technology and robust firewall security features in providing broadband Internet connection to a small workgroup. With integrated WLAN, QoS, firewall print server and 4-port Ethernet switch, it's an ideal device for those creating their first remote connections, as well as for more advanced users looking for additional features. 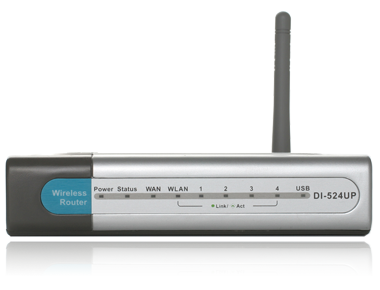 The D-Link AirPlusG DI-524 wireless router is the ideal networking solution for homes and small offices. This router combines the high-speed 802.11g wireless technology and robust firewall security features in providing broadband Internet connection to a small workgroup. It's an ideal device for those creating their first wireless networks, as well as for more advanced users looking for advanced network protection and content filtering. The DI-524UP router offers a maximum wireless signal rate of up to 54Mbps through its wireless channels, allowing streaming videos and other high bandwidth applications such as on-line gaming and video clips to operate without the hassle of Ethernet cables. The ability to handle high bandwidth applications also makes streaming real time programs more enjoyable and more efficient. This router supports priority queues to enable a group of users to experience the benefit of smooth network connection of inbound and outbound data without concern of traffic congestion. This QoS support allows users to enjoy high broadband transmission for applications such as VoIP, multimedia and on-line games over the Internet. Access control is provided with packet filtering based on port and source/destination MAC/IP addresses. With Virtual Server Mapping, the router can be set to allow separate FTP, Web and multiple games to share the same Internet-visible IP address while still protecting your servers and workstations from hackers. You can configure any of the built-in LAN ports of the router to function as a DMZ port. Parental control allows you to filter out undesired URL web sites, block domains and control the time of day of the use of Internet through scheduling. VPN pass-through is provided to let mobile users access files and mail from offices to work at home without having to use complex VPN client software. A USB printer port and integrated print server function allow you to share out a USB printer. Users can send out web pages and files to the printer for printing. The print server supports TCP/IP, Line Printer Daemon Protocol, Microsoft Windows, Unix and Mac OS. In addition, an integrated 4-port switch allows ready connection of up to 4 computers. This saves you the cost of purchasing and installing a separate switch for network computer connections. A simple, intelligent web-based setup wizard is provided with this router to allows users to quickly set up the router and connect computers to share a high-speed Internet connection, files, resources, games or just to communicate. The router is designed for easy and robust connectivity among heterogeneous standards-based network devices. 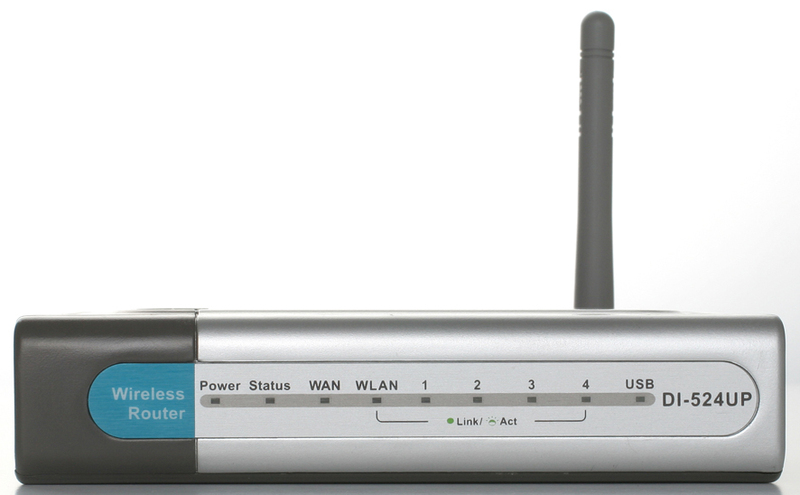 Computers can communicate directly with this router for automatic opening and closing of UDP/TCP ports to take full advantage of security provided without sacrificing functionality of on-line applications.